Dr. Paul delivering a Palmer Diversified Adjustment. 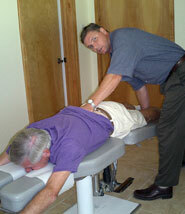 Dr. Paul performing Flexion Distraction Technique. If you’ve been to a chiropractor before and prefer to be adjusted in a particular way, let Dr. Paul Van Berkel know. We want you to relax, enjoy and fully benefit from your chiropractic care. 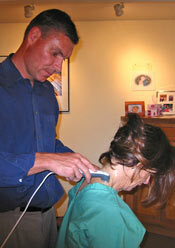 Dr. Paul administers Therapeutic Ultrasound to a patient. Therapeutic Ultrasound: This therapy is utilized by Dr. van Berkel in order to reduce inflammation and break up deep scar tissue or trigger points. Electric Muscle Stimulation: This therapy is utilized by Dr. van Berkel to reduce muscle spasm, or rehabilitate injured or weakened muscle groups. It truly amazes me how many terrible car wrecks I see every day in my daily commute to work and home. Should you be the unfortunate recepient of spinal injuries sustained during a motor vehicle accident, please consider treatment with our clinic. Dr. Paul is one of very few practitioners in the valley with a C.C.S T. certification. This means a 120 hours of post graduate study just in the proper diagnosis and treatment of spinal injuries. We will gladly work directly with you in settling your case with the third party auto inurance company OR work with any personal injury attorney of your choise. Please feel free to discuss any concers regarding insurance and MVA’s as we have almost 20 years of experience and are here to help YOU! Clinical Nutrition seeks to restore or achieve better health through proper nutrition, accurate supplementation, and chemical balance. We are able to treat a wide variety of difficult health concerns through proper functional testing and subsequent implementation of a nutritional protocol. Some of the conditions successfully treated through Clinical Nutrition are Fibromyalgia, Chronic Fatigue Syndrome, Hormonal imbalances, and gasto-intestinal disorders. Functional testing is outsourced through Genova Diagnostics (formerly Great Smokies Diagnostic Lab). Please see our Clinical Nutrition page for more information. Because there is always a “soft tissue” component to spinal problems, we have the ability to individually evaluate and then start you off on a personalized rehabilitation program. Our goal is to assess exactly what exercises will benefit your condition and your health goals, and then implement a low-tech program that can be learned in our clinic and followed up on at home. Our rehab programs will stay problem focused as to remain simple enough to not get you overwhelmed. The programs will only utilize equipment that can be purchased at our clinic or any sporting goods store. They most involve Therapy Balls and Therapy Bands. Call Agave Chiropractic today to make an appointment!